With Kill Bill: Vol. 2, Vol. 1 looks like a movie’s worth of set-up; what we get to now is the meat. Quentin Tarantino’s conclusion of his story is lighter on over-the-top gore and heavier on a few scenes of genuine emotion. Nonetheless, while it’s somewhat more subdued, Vol. 2 very much feels like a continuation and completion of Vol. 1, and fans of the first should enjoy the second. Having crossed Vernita Green (Vivica A. Fox) and O-Ren Ishii (Lucy Liu) off her Death List, the Bride (Uma Thurman) is gunning for the last two remaining members of the Deadly Viper Assassination Squad, Budd (Michael Madsen), who’s fallen out of shape and is now a bouncer in a low-end bar but might not be as easy a target as he seems, and Elle Driver (Daryl Hannah), who’s itching for a chance to face her one-on-one. And of course, at the bottom of the list is Bill (David Carradine). Vol. 1 was heavier on over-the-top action than Tarantino’s trademark lengthy, offbeat monologues and conversations, but Vol. 2 finds more time for characters saying odd things. When Michael Madsen’s Budd asks why O-Ren Ishii’s bodyguards called themselves the Crazy 88s when there wasn’t actually 88 of them, Bill answers ‘probably because they thought it sounded cool’. Elle Driver rattles off detailed information she got off the internet about the Black Mamba snake, and in the last hilarious little touch, flips through multiple pages of a notepad where she wrote all this down, as if she’s just been carrying it around with her until she gets to savor sharing it with some helpless victim; after informing us that the Mamba’s amount of venom is ‘gargantuan’, she also makes the hilariously oddball comment that ‘you know, I’ve always liked that word, ‘gargantuan’…so rarely have an opportunity to use it in a sentence’. Budd has a rare philosophical moment, acknowledging ‘that woman deserves her revenge….and we deserve to die’. Bill goes on a monologue about Superman that takes a few minutes before his point starts to emerge. And in a couple key scenes, not only does Tarantino show off his knack for quirky dialogue, he also uses the drawn-out conversations to build an uneasy tension about what’s going to happen when the talking’s finished (Tarantino would employ this much more heavily in 2009’s Inglourious Basterds). Vol. 2 also fleshes out the past between the Bride and Bill, revealing that they were lovers, and starting out with an outwardly pleasant conversation between them with an undertone of unease in a black-and-white flashback to the day of the wedding rehearsal massacre. We also have a lengthy flashback sequence showing the Bride’s martial arts training under Pai Mei (Gordon Liu), who’s an intentional caricature of wise Asian mentors in kung-fu movies (check out how many times he ‘thoughtfully’ strokes his long white beard). The long-awaited, drawn-out final confrontation between the Bride and Bill is more verbal than physical, and despite the wackiness surrounding him, Tarantino makes a notable effort to portray Bill as more of a three-dimensional, even occasionally semi-sympathetic character than a one-note over-the-top moustache-twirling villain. 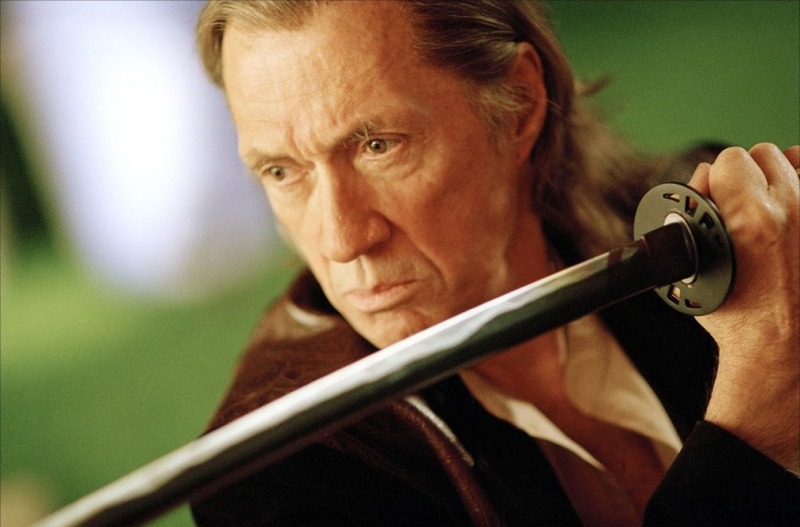 Kill Bill may often be intentionally cartoonish, but there’s nothing cartoonish about Bill himself. 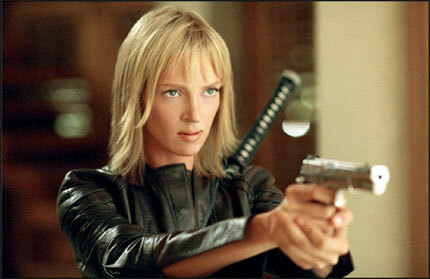 Uma Thurman has more required of her here- not just physical prowess, but emotional range, and she’s unfailingly solid. Just as Bill is developed here into more than a one-dimensional master villain, so do we see the Bride as more of a human being than just an unstoppable avenging angel of death. We even learn her name. David Carradine’s Bill is unflappably cool and controlled, and soft-spoken, with a hint of steel in his eyes. He’s capable of ice-blooded violence, but in his final conversation with the Bride, he admits he ‘overreacted’ in his treatment of her and seems wholly sincere, and their final moments prove to have more poignancy than celebration of victory. Of the others, Michael Madsen has a few amusing lines as his usual laconic self, and Daryl Hannah seems to relish playing against type as the eyepatch-wearing, vicious Elle Driver. Gordon Liu is great fun lampooning the traditional kung-fu master role, Michael Parks, who played the sunglasses-wearing Sheriff in Vol. 1, reappears here, only this time unrecognizably as an eighty-year-old Mexican pimp, and there’s a throwaway cameo by Samuel L. Jackson. While Vol. 2 is less kinetic and gleefully over-the-top than Vol. 1, it’s more satisfying and more mature. There are no wounds shooting geysers of blood, and the face-off between the Bride and Bill is more about the characters than over-the-top action. In fact, there’s no big action sequence on the level of the Bride taking on the Crazy 88s in Vol. 1. When the violence comes here, it’s in short, abrupt bursts, although there is an entertainingly over-the-top knock-down drag-out fight between Uma Thurman and Daryl Hannah that echoes the opening fight between Thurman and Vivica A. Fox in Vol. 1. As before, the soundtrack borrows heavily from 70s exploitation flicks to intentionally incongruous effect, and Tarantino retains some of his flairs from the previous installment, like the split-screen showing both combatants when they separate during a fight, and the amusingly melodramatic alarm sounds that blare when the Bride spots an enemy. All in all, the two make for an entertaining, offbeat pair of movies, with Vol. 1 bringing the over-the-top action and Vol. 2 bringing a little more character and a hint of more depth. Those who enjoyed the first should enjoy the second, though perhaps not for all of the same reasons.